Home » Posts Tagged "ebay"
Sometimes when I buy something, even if I end up hating it and/or not using it, I tend to hang on to it just because I bought it. Not sure why I do this, but it happens. This week I’m trying to buck that trend and get rid of something I bought and never used. Its an Amphipod running belt for holding water. 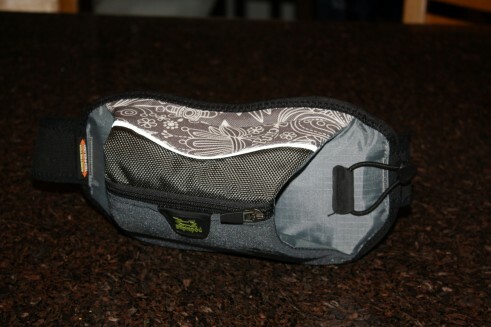 Its a great product and I bought it used at the REI used gear sale, so I didn’t pay much for it. It just doesn’t work with my running style so I bought it, tried to use it once and then it has just sat around ever since. So onto eBay it goes so hopefully some happy runner can use it and it no longer sits around my house. Do you do this too? What have you bought that you never use that you still hang on to? I sometimes buy things I don’t need because they are a good deal and *might* need them someday. Apparently I did that 3 different times on the same product. I cleaned out my office closet recently and found 3, still new in their boxes, 2.5″ hard drive external enclosures. I bought the same product 3 different times, and have yet do use any of them. That’s a clear sign that they need to go. So for this week, I put them all up on eBay. If you need a 2.5″ external enclosure for an extra hard drive you have laying around, then here are three for you to choose from. What crazy things do you buy over and over whether you need them or not? Or is it just me? For this weeks 1AW I’m getting rid of an old battery and charger from my old Canon camera that I was getting rid of from a previous 1AW. If you saw the update to that post, I did not sell the camera, but rather had it replaced with a brand new camera from Canon for free! I just learned this the other day so I thought I’d share how I decide weather to sell something on eBay vs Craigslist vs just giving it away. If the item is large and I don’t want to mess with shipping, but is still of some value I try to sell it on Craigslist first. If the item is of questionable value (read: will someone buy this junk?) I do a search on eBay for others selling the same or similar items. And trust me, people buy crap. There are A LOT of people who buy A LOT of crap on eBay. There is a very cool new tool I just learned about that lets you search for what people have sold the same or similar items for. On the left side you can filter your results to show or not show certain things. 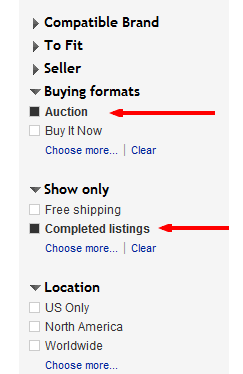 First you can select if you want to see auction style listings or the buy it now type. The second and really useful feature is the show “completed listings” option. This will show you all of the sales that have completed in the past for that item so you can see exactly for what those same or similar items sold for to see if its worth your time selling it on ebay. I just did a search for this camera battery and charger and there are a lot of cheap Asian after model versions not selling on ebay so its not really worth my time trying to sell mine, so I will probably just give it away. side note: Does anyone need a used Canon SD110 battery and charger? The internet is pure awesomeness. It really is. As part of my 1-A-Week program where I’m getting rid of something I don’t need/want/use anymore I was selling my old broken Canon Powershot on eBay. I loved that camera and it took THE best photos ever, but it was also many years old, had traveled the world (and it showed) and just didn’t work. That model camera however, was fetching very high prices on eBay for some reason I didn’t know at the time. I put the camera up for auction and immediately received several inquiries asking to buy it now for some decent amounts for a broken camera. Then I got a very nice email from someone on eBay telling me that Canon would fix my camera for free as it had some defective sensor that they knew about. So I removed the auction, clicked on the link that the nice eBay member sent me, and filled out the form on the Canon website. I then sent my camera off to them and low and behold today I received a package in the mail with my camera in it. Well… not my old camera, but rather a new PowerShot SD980 IS!!! How awesome is that? How awesome is Canon?! How awesome is that nice eBay shopper who took the time to send me that link?! Thats why the internet is awesome. Not only is it letting me get rid of stuff I don’t need/want/use and even make some money doing it, but it allows nice people to make these small connections help out one another. And thats what its all about. So now I have a new camera that I’m going to get rid of again for this weeks’ 1AW as I don’t need another camera. I already replaced the old one with another small Canon PowerShot . I really do love Canon cameras. So this one will go to my sister for her birthday, as she needs a new camera. Happy Birthday Sis if you are reading this! 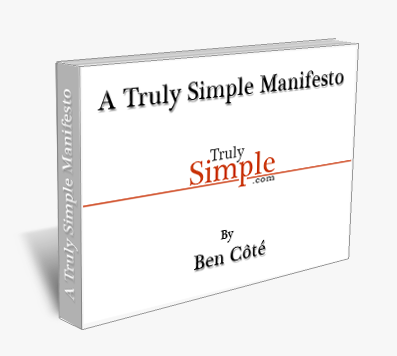 Also I’m behind posting my 1AW for a few weeks as I was updating my site. So for the last 2 weeks I got rid of some clothes to Amvets and some old computer parts/cables on Craigslist. What item can you get rid of this week that you don’t need/want/use anymore? I’ve been having quite a bit of luck with my 1AW project and actually making some nice cash in the process via eBay. I missed posting last week, so here are two items that are going up on eBay today that I am getting rid of. The first is my old Canon SD110 camera. This little 3.2 megapixel camera is seriously the best camera I’ve ever owned. It takes took amazing photos like this one. Thats my dog Keaton. Isn’t she pretty? But alas, it has traveled around the world and is just worn out, but I did a bit of research and found someone who just sold the same camera, also broken, on ebay for parts and just made $76.76. So this one goes on eBay as well. The second item is the first 4 books from the Buffy the Vampire Slayer comic book set. These are new books, still in their packaging and have been sitting in our closet for years. You know when you like something and people find out you like it, then thats all you get for Christmas and birthdays? Well my wife liked Buffy. Actually I did too, it was a great show with amazing writing by Joss Whedon. That said, my wife used to get Buffy stuff as gifts. We liked the show, but we don’t need any comics based off the show. I don’t think either of us have even ever opened or read them. So thats why they are getting out of our house and hopefully into somone’s that can appreciate them. So these go up on eBay for some Buffy fan to enjoy. What are you getting rid of this week that you don’t need?